Pharisees, and Why baptized John the Baptist? Esta lectura en español (This reading in Spanish): Fariseos, y Por qué bautizaba Juan el bautista. Jesus and John: Both baptizing (3:22-36). Jesus Christ is life and light (1:1-5). (Joh 1:24) And they which were sent were of the Pharisees. (Joh 1:25) And they asked him, and said unto him, Why baptizest thou then, if thou be not that Christ, nor Elias, neither that prophet? (Joh 1:27) He it is, who coming after me is preferred before me, whose shoe's latchet I am not worthy to unloose. (Joh 1:28) These things were done in Bethabara beyond Jordan, where John was baptizing. (1:24) Pharisees, comes from a very significant term for supporters of this group, meaning "separated". There were two major divisions: the Pharisees and the Sadducees, both disagreed with Christianity because they interpreted the law differently than Jesus, and generally didn't believe in Him. When the Jews returned from Babylonian captivity to 537 before Christ, two groups were formed which then evolved: Hasideos become in Pharisees, Sadducees in Hellenists. These two groups were a different reaction to foreign cultures: the Hellenists (Sadducees) sympathized with the Greeks and Hasideos (Pharisees) no. The Hasideos, like already it mentioned, became in Pharisees, were the most zealous and conservatives of the Jewish religion, they supported the high priest, even when this one was clearly Hellenistic (but not always all the High Priests had the support of the Pharisees, such as John Hyrcanus who became Sadducee, but it would be enter in many historical details). Moreover the Scribes, in New Testament times, were both Pharisees and Sadducees, despite forming a separate group, however the majority were Pharisees, because they supported their tradition. The Pharisees having great zeal for the law and religion began in some way to comply it exaggerately, even making laws for not violate laws of the Sacred Law, and accepting also the traditions -for not to say superstitions-, from Scribes. In front of colonizing foreign influences, and against a group that was straying from their beliefs (Sadducees) were immersed even more in these and until an extremal point, formal and machined of their religion and tradition. When meeting the Pharisees with Jesus' followers, and Jesus himself, there were many differences; Jesus in a way in debates with the Pharisees and Scribes it confronted the essence of the law against the tradition of men. John the Baptist also had no empathy with this religious division that had become the most important among the Jews. When Christianity emerged, it formed practically another religious division among Jews. Many times Pharisees and Sadducees confronted Christianity and its doctrines, however this act didn't mean to be consolidated to form a single group, but both felt threatened by Jesus who showed an interpretation of the Law based in the essence and not in appearance, which one was not accepted by them. Jn. 1:24 Indicates that the priests and Levites mentioned in 1:19 were the most zealous of the Jewish tradition. Messianic hope (the Messiah would restore the glory of Israel), the Messiah will rule the world, predestination, the soul is immortal, resurrection of the dead, reward and punishment after death, God gives His grace to those who comply to the Law in every detail of the life, also exist a intermediate place before the final judgment, where they expect things to come, and traditionally have a strong nationalism. Jn. 1:25 The word baptize (baptizo) means to immerse; this practice apparently was not entirely unknown to the Jews, in fact in 2 Kings 5:14, in translation Septuagint (the Greek version of the AT realized in the first or second century aC. ), to translate 2 Kings 5: 14 Is used this term that means immerse. I might add as evidence for example, in the ancient basilica of St. Miguel, now called Terrassa, in Spain, there's a baptistery shaped tub, with the size needed to immerse people, this one exist since the last years of V century. Were also found representations of the early years of Christianity, with the baptism by immersion. It's amazing how such details as whether a person was immerged in water or simply soaked their head slightly in the baptismal rite, it has created serious discussions between Catholics and Protestants. Representing baptism is a change in the person doing it (the new birth), and a public expression of an act of faith to fulfill God's command. One who is baptized is immersed in water for a moment by a religious authority (some add prayer) in the name of Jesus Christ, and to go through the water is like if is left behind along with this one, a remote life of God as a sign of repentance of sins to be ready for Jesus, who brings the most important baptism that is the spiritual (sometimes the total change, the filling of the Holy Spirit in a believer takes years to achieve, others the Holy Spirit decides fill immediately). The rite is public in signal of statement of faith. In itself, the water doesn't forgive sins, is a sign of repentance that one offers, in signal of a new birth; who forgives sins is Jesus, God. Baptism is a command, found in Matthew 28:19, Mark 16:16, John 3:5, Acts 2:38. It's noteworthy that the Pharisees who questioned to John doesn't interrogate him about this practice and its meaning, if this they did it is because was known it by them, or it accepted in some way or was not important to them if he dips people into a river. They asked why he does this if he not is the Christ or the Prophet Elias. By insisting on the issue of who is Juan, they sought that he answer he is the Christ, Elijah or the Prophet to capture him, for kill him or something similar, from this way he would not attracted so many people? Very likely. Jn. 1:26. Clearly refers to John himself, who baptized in water, and Jesus who had not yet begun his ministry of preaching salvation fervently doing signs, miracles and teaching the true essence of communion between God and man. Obviously, similarly they distrusted of John and interrogated him to capture him, then, so they did it with Jesus Christ. Jn.1:27 John the Baptist, always in his humility and having in mind that he was only a messenger, says in his greatness that although he has come before of which they don't know yet, which would coming is bigger than him, and he didn't even feel worthy to be his slave to untie the straps of his sandals being he crouched and wash his feet . Do you understand right? 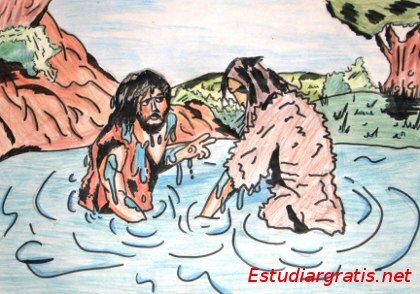 Who diped in water to men in the wilderness preaching repentance of sins, which was considered in that time by great prophet by many Jewish, and whom the leaders interrogate cause to attract many people, said that someone would come along so great that not even he felt worthy to be his slave, talking about Jesus Christ. Obviously with this answer, the evangelist John, shows the end of the questioning by the Pharisees. Where was John the Baptist baptizing? Jn . 1:28 There are two Bethany, the most known is three miles from Jerusalem, more down is Belen, near the road to Jericho and there lived Lazarus, Martha, Mary and Simon the leper. This Bethany means "house of date palm" or of figs, and is not near from Jordan. Another Bethany, which is "beyond the Jordan " was a place located on a derivation about 300 meters of the Jordan River, and 15 km from the Dead Sea, a big and clear place. John the Baptist was no always there, was also eg in Aimon (Jn. 3:23) 60 km further north, also on the banks of the Jordan. The complication arises because in several manuscripts contained as Betabara and not Bethany (in the best manuscripts list as Bethany). It seems then that the place here indicated, is Bethabara, but not Bethany as stated in the best manuscripts (or take that there were two different Bethany). East of the Jordan, that is 15 km from the Dead Sea going to Sea of ​​Galilee, near to Jericho, is where apparently John the Baptist was baptizing more. Then "desert" (Mt. 11:7 ) not is in this case a hostile place where there is only sand, but a place uncultivated, extensive, where people didn't live generally (but could be vegetation and even a river) comes from the Hebrew word midbar, in Spanish it's usually translated as "wilderness". In a sign of repentance of sins, preparing people to follow to someone more big than him, to the one who already was among them: Jesus Christ, who baptizes in the Holy Spirit, dipping people into a new spiritual life. I invite you to strive for be in the new life that Christ gives.